The reason I chose to start using green cleaning alternatives is because I wanted my HOME to be a healthy environment. We breathe more air INSIDE our houses than we usually do OUTSIDE. 10 years ago, I used the typical cleaners you normally buy at the grocery store. I loved a clean house and I felt like if it didn’t SMELL clean, it WASN’T clean. (What does clean smell like anyway?) I used to use a mop that used disposable pads and disposable bottles of anti bacterial cleaner attached to the handle. I had a crawling baby and was diligent in using that mop often thinking those floors needed to be as clean as possible since she was crawling around all day on them. That’s why we buy cleaners, right? So that our houses will be CLEAN. What I didn’t realize was the trail of toxins I was leaving everywhere that were actually MORE harmful to my baby than germs. Sure enough, I read the fine print on the back of the bottle. It said, “HAZARDOUS TO HUMANS!” If you don’t believe me check out a bottle of antibacterial wipes next time you go to the store. That was when I started looking into greener products. I wanted to use products that cleaned my house but that I didn’t have to padlock in a high cupboard for fear that if my little ones found them I might be rushing them to the ER. Now, I can hand my child a spray bottle and a rag and let them go crazy helping me clean with no worries that their brain and lungs are being overwhelmed with harmful chemicals. 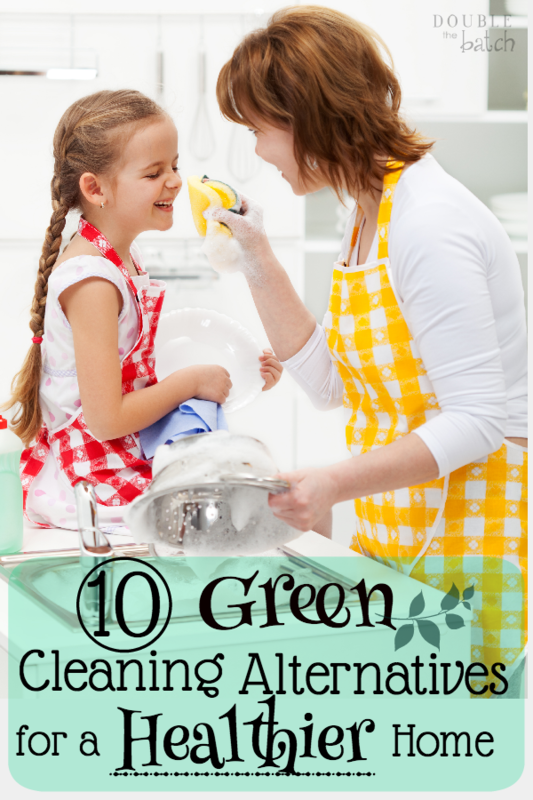 I realize there are lots of awesome green cleaning alternatives on the market, and I also realize that there are ingredients that can be used to clean for next to no $ at all. I’ve tried to include a little of both. Glass cleaner. Goodbye little bottle of blue cleaner. If you really want to save some money, make your own! I have used the recipe found here from Wellness Mama and it works great and is almost free to make! (Woot woot!) Or, as an alternative, these microfiber cloths can be used with just water to clean your mirrors and windows. They are my current fave! you can’t get cheaper than water! Microfiber towels. I will admit, paper towels still sit on my counter. With 4 little kids running around, there are just SOME things that I only want to clean up with a paper towel that can be THROWN AWAY! For the most part, though, we use our microfiber cloths for everything else and then I do one load a week with just microfiber. I have been doing this for 5 years now and still swear by it. It has saved us money, is better for the environment, and works so much better! Try cleaning a counter with a disposable wipe or paper towel and then try a lush microfiber cloth. Much better!! Once again, Ecloth are my current favorite because of how well they clean and remove germs but also because they last up to 6 years! If you want to just buy some cheaper yet good microfiber cloths that will get the job done, these are a more frugal alternative, although they will have to be replaced more often so…not cheaper by much in the long run. Toilet bowl cleaner. I have an 18 month old that would love nothing else than to play in the toilet. As much as I try to keep those lids down and those bathroom doors closed, he still manages every now and then to sneak in and have his toilet bowl party. (Gross!) In fact, that is why, as of 4 days ago, I found myself at Best Buy buying a new cell phone. After combing the house for over an hour looking for my iPhone, I finally found it…in the toilet. At least I don’t worry that that the toxic reside from toilet bowl cleaner is all over his hands and sometimes….mouth (again…GROSS!) If you want to save some money, just use baking soda and vinegar. Read how here: How to use baking soda and vinegar to clean a toilet. Or, if you’re in a hurry and just want something pre-made, I like to use this toilet cleaner. https://www.onegoodthingbyjillee.com/2012/04/super-fast-and-easy-homemade-laundry-detergent.html and I also love this brand if you don’t have the time or don’t want to make your own. Fabric softener. One word. Vinegar! Using vinegar also helps to keep your washing machine clean too. Use about 1/2 cup per load. I haven’t used fabric softener sheets for 6 years now and I don’t even miss it! Muti-surface cleaner. My favorite recipe for just a basic multi surface cleaner is just a spray bottle filled with water, a squirt of natural dish soap and some yummy smelling essential oils. 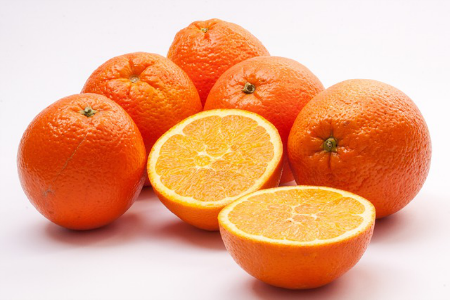 Citrus Bliss essential oil blend literally makes my kitchen smell like Jamba Juice! I would much rather smell that than those horrible chemicals! Pair it with a microfiber cloth and you’ve got a mega-clean-orange-dream-machine smelling kitchen. YUM! If you would like to buy a pre-made cleaner, I highly recommend the following companies: The Honest Co, Cleanwell, Seventh Generation, Bio Kleen, and The Better Life. Air Freshener. Seriously. Ditch those awful sprays that are loaded with chemicals and give your lungs a break! Yesterday my house smelled like a mixture of sewer, moldy trash, and urine. It was disgusting! I had forgotten to take out the kitchen trash the night before after I had cleaned ‘beyond questionable leftovers‘ out the fridge and ‘someone’ had thrown a diaper behind the babies dresser and ‘neglected’ to tell me about it. That combined with the dirty dishes in the sink was about to send me over the edge. No fear! I quickly got rid of everything that was causing such a stink, and then filled a spray bottle with water, a little dish soap and about 20 drops of Purify (or you could use lemon, peppermint, or any other great smelling essential oil) and sprayed the air and every surface. I swear my house was magically transformed like magic from a dirty smelly dump to a California orchard. Here’s a bonus! Want a hand sanitizer that’s natural and smells great too? I absolutely love these little sprays! I use them all 9 months of the school year and they are great! No more worries about your little ones getting drunk by eating hand sanitizer! LOL! Using green cleaning alternatives is really not that hard. If you aren’t doing it for the earth, at least do it for the health of your family. You might actually find you love it! I did.